The calculation of commissions is a very complex problem, yet the majority of companies use highly manual processes to do the work. With more industry standards such as Sarbanes-Oxley Act, HIPPA, PCI etc., the extensive usage of an automated sales commission system has become an essential part of the today’s business. With the QCommission application, we are able to eliminate the complex problem of calculating sales commissions.For sales people, nothing is more important than earning a commission for their sales performance. Sales people work hard to close their sales and expect to get their sales commissions accurately and on a timely basis. For sales people, nothing is more important than earning a commission for their sales performance. Sales people work hard to close their sales and expect to get their sales commissions accurately and on a timely basis. They expect the calculations to be accurate based upon the agreed upon compensation plans. They need transparent and detailed statements that explain the basis of every calculation. The majority of sales people would agree that they do not get a clear and correct commission statement. Compensation plans are by their nature complex. The data needed to calculate the plans is not always available from a single source, the plans change on a regular basis and there are exceptions to the exceptions. 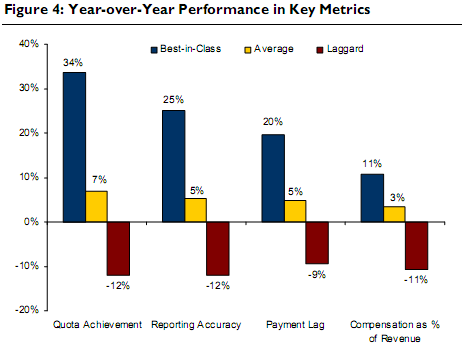 Sales people get their sales commissions typically weeks after the period is over. Frequently the crediting and calculations are incorrect. As a result, the commission statements are not clear and obvious. They have no idea how they are getting paid, or waste time trying to figure out what they should get paid. Companies and sales people have to deal with compensation litigations for paying less or paying over the expected results. With the advent of CRM systems, companies are attempting to automate the sales process and customer interactions/management. 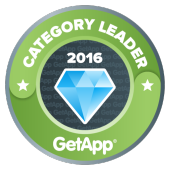 More and more sales people access CRM systems to get their job done. But there have been challenges in CRM adoption as sales people resist the solutions. If salespeople have to access the CRM system to get access to their commission statements, they are more likely to use the CRM system for its intended purpose. If a salesperson knows they can help get paid accurately, they will make sure to keep the systems accurate and thus help keep the system up to date. A commission solution that can accurately establish and calculate commissions and can seamlessly provide the commission statements for viewing by sales people can be a great advantage to firms. In addition to reducing commission errors, reducing time taken to administer and increasing sales people productivity, the solution can increase MS Dynamics CRM adoption. QCommission is a powerful, flexible sales commission software tool. It calculates sales people’s compensation, accurately, quickly and professionally. QCommission is integrated with MS Dynamics CRM as well as accounting systems such as Microsoft Dynamics Great Plains, Microsoft Dynamics AX, and QuickBooks. Microsoft Dynamics CRM is a customer relationship management (CRM) software focuses mainly on sales, marketing & service sectors. It is part of MS Dynamics suite of business applications. 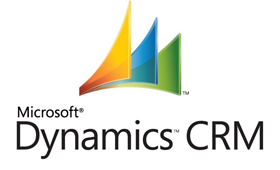 The latest version of MS Dynamics CRM is version 2013 with over 40,000 customers. Microsoft has been marketing Dynamics CRM as an XRM platform and has been encouraging partners to use its proprietary (.NET based) framework to customize it to meet many different demands. MS Dynamics CRM is available as Cloud as well as On-Premise installation. Microsoft supplies a Software Development Kit(SDK) for integrating with Microsoft Dynamics CRM. Use of the MS Dynamics CRM SDK makes sure that the integration works well with the various versions and models of MS Dynamics CRM. The SDK also ensures that the third party product is properly authenticated prior to getting access to the MS Dynamics CRM data. 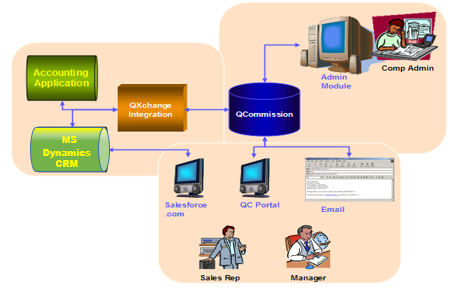 QCommission utilizes a technology called QXchange to integrate to other applications including MS Dynamics CRM. Specific data access plug-ins (DAP) for different systems can be added to QXchange to integrate with various different data sources. 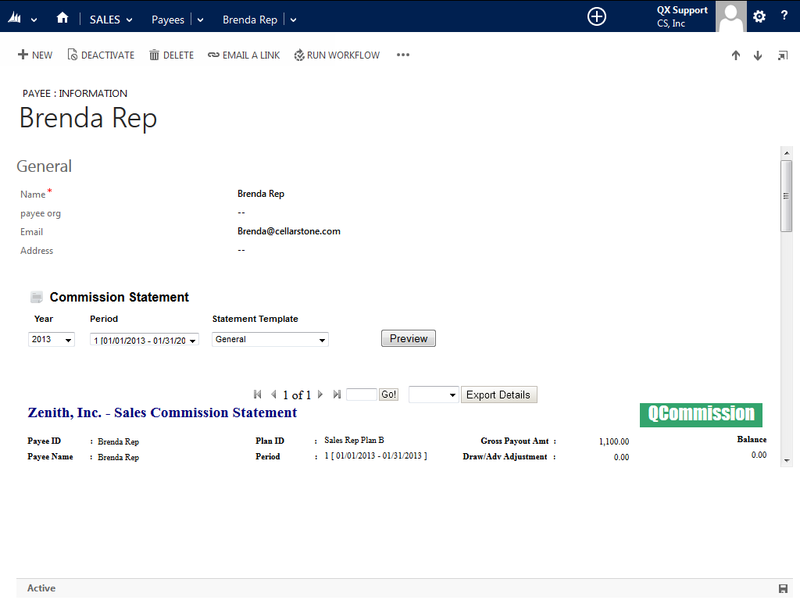 A special DAP for MS Dynamics CRM allows QCommission to exchange data back and forth with MS Dynamics CRM. A unique ability of QXchange is that QCommission can access any data object in MS Dynamics CRM including custom objects. This allows very flexible integrations. Commission is a web based application. It is used by compensation administrators to setup the master data such as Customers, Products, Sales Reps, Commission Plan related info such as Commission Rates and Incentive Plans. 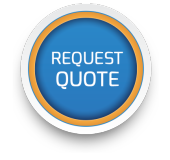 Transactions such as sales orders, invoices and payments also can be imported into the system using QXChange. Commission plans can be unique by sales people or common across groups of people. Data for commissions calculations can come from various sources such as accounting system, order taking system etc., but is primarily invoices from the corporation’s accounting systems. Commissions are primarily calculated on Revenue. Revenues are mostly based on invoices entered into the accounting system. This is the primary data that is imported into QCommission. Opportunities within MS Dynamics CRM can also be imported into QCommission and treated as transactions against which commissions should be calculated. Various attributes of transactions can be used in the calculation of commissions. In many situations, sales reps are directly associated with transactions. This can be used in properly crediting the transaction to the sales rep prior to calculating commissions. But other attributes such as Territory, Manager, Product, Account, etc can also be used to credit sales. Other data attributes useful in commission calculations include Quantity, Amount, etc. Calculations are done on a periodic basis. The calculation process in QCommission produces commission results for each individual sales person in the system. The most effective way of getting the commission results to the sales people is to present the results through a CRM system such as MS Dynamics CRM. 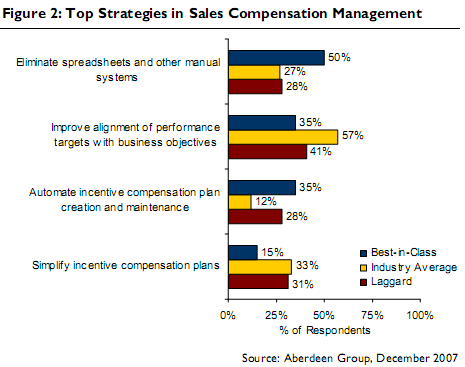 The sales person’s commission’s results are presented within MS Dynamics CRM. Comprehensive manner. Sales people are already familiar with MS Dynamics user interface. We leverage that knowledge so they do not have to learn a new tool. Sales people already have access privileges to the CRM system, authenticated by using MS Dynamics CRM SDK system. QCommission utilizes the same access to allow access to its functionality. QCommission can also be accessed directly from within MS Dynamics CRM using Single Sign-on (SSO). This passes through access and still appears seamless. 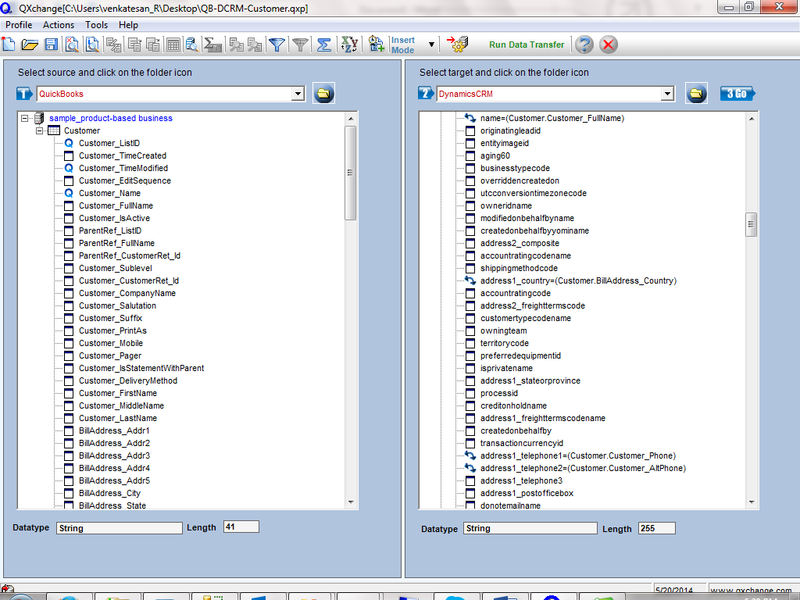 Currently QCommission supports MS Dynamics CRM 2011 and 2013 Editions. QCommission does a tremendous job calculating individual commissions for the sales person. It brings that calculated data to the salesperson directly within the MS Dynamics CRM system or passes through to display more securely. This integration ties the two systems in such a manner that the complexity to the customer is reduced to a minimal level. "I’ve been very impressed with what I’ve seen “under the hood” within the database. Also, QCommission team have been great to work with, clear about what’s going on with some of the issues we ran into, and be very reliable with the delivery of fixes and changes we’ve come across. The output of all the CellarStone team in terms of both quality of the work and the speed in which it’s completed has been fantastic, and I believe has given both the IT staff and the business users a high level of confidence in the system."